This deliciousness is so easy to make, that I surprised myself. 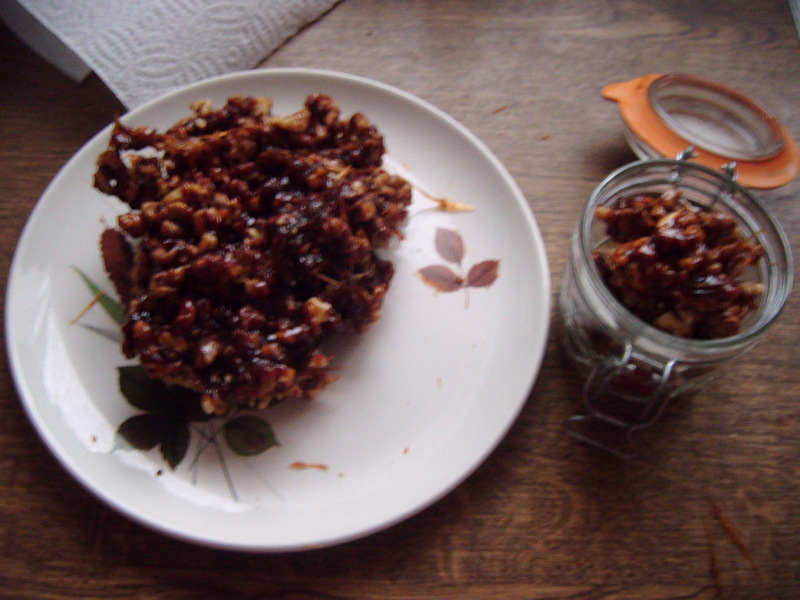 It only uses a maximum of 2 ingredients, granulated sugar and in this case a packet of chopped walnuts, If you put a quantity of granulated sugar in a saucepan on a low heat, it may take a while and you will have to make sure you keep an eye on it otherwise it will burn. The sugar will start to caramelise before your eyes, once all the sugar is caramel in colour and all the sugar dissolved, then comes the fun part, by adding fruits or nuts of your choice. Endless fun can be had, then putting on a plate and letting it cool before putting it in jars before the season’s festivities begin, if you don’t start munching them in the mean time. This entry was posted on 23/11/2014, in New Cakes and Ideas 2014, Sweet Treats, Uncategorized and tagged caramel, chopped walnuts, granulated sugar, wa;muts.